The edible seasons are flying by. While there are some late bearing strawberries to be had, the season is pretty well over. Berries will be finished soon. CSA baskets are now brimming with zucchini, tomatoes, eggplant and peppers. But there are still stone fruits. Delicious, juicy, inspiring stone fruits. And to celebrate, I’m sharing two recipes plus a recipe idea that still needs tweaking. Peaches, nectarines and (to a lesser extent) apricots. Oh my! I can still remember when my son was all of about 9 months old. I bought a little basket of peaches from a local stand and cut one up (quite small, obsessing over ensuring that my firstborn would not choke). He adored the treat, and we shared most of them over the next few days. The memory of sitting on the couch with my little boy (and he was so little back then… I imagine I’ll look back on him now at almost 9 years old and say the same at some point), enjoying ripe, local peaches floods back every summer. Now it’s my daughter who can’t get enough of them. I’m lucky if I get one or two. Ditto the nectarines. 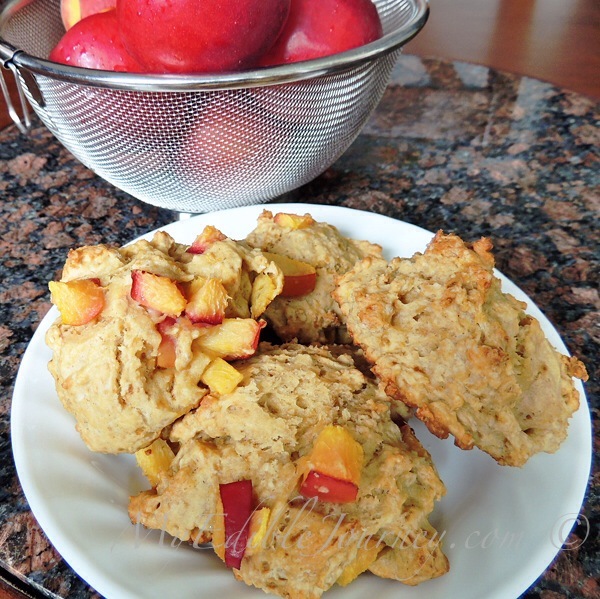 Because peaches and nectarines in particular are so versatile, I got creative with them recently. 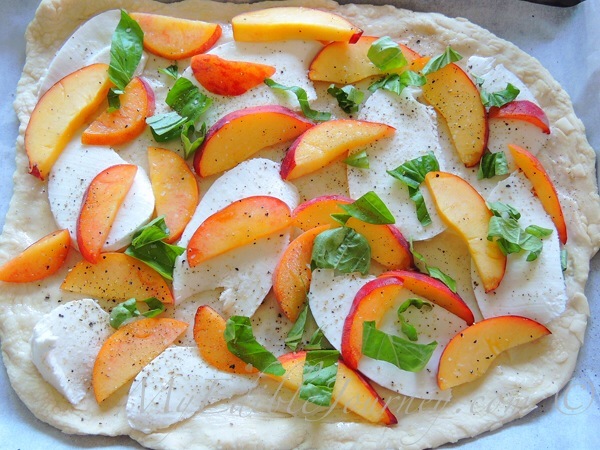 Peaches made their way onto an interesting pizza, with buffalo mozzarella, fresh basil and cracked black pepper. I don’t have a recipe, but I can say that if I were to do it again, I’d use regular mozzarella, or even fontina. Even with salt, the buffalo cheese was just too bland and actually took away from the flavour of the peaches. I also don’t have an “after” pic of said pizza. Sorry. The salsa and scones were good though. In fact, the salsa came to the rescue when a friend, in a bid to eat healthier, opted for a (healthy, but dry) turkey burger at a barbecue. I brought her a container of this delicious concoction and she promptly gave me a hug. 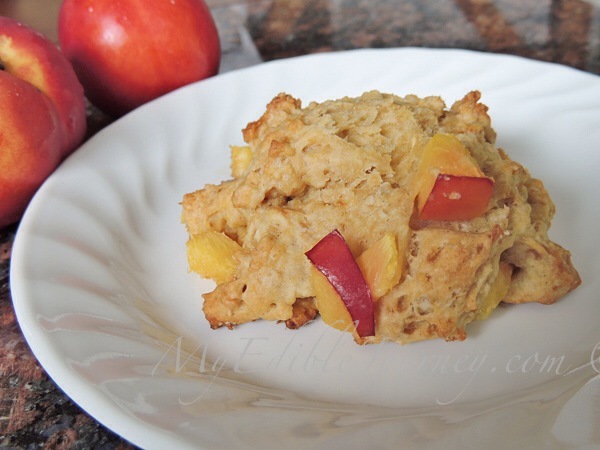 The scones were the perfect foil for the juiciness of the nectarines, which are slightly firmer than peaches and hold up well in baking. Besides being obviously low in fat and high in fibre, these stone fruits are a great source of potassium and vitamin C. Apricots are also high in vitamin A. We’re not big on apricots around here, but they can be used in either of these recipes. Combine everything and let it sit in the fridge for a few hours to mellow and for the flavours to blend. Taste and adjust the seasonings if needed. You may want more lemon or honey, depending on the sweetness of the peaches. Serve with grilled pork or fish (mmm, fish tacos). I refer to these as “drop scones” because they’re made just like drop biscuits. No fussing over the butter being cold, no worry about getting the dough together without really touching it. Interestingly, in the U.K the term “drop scone” can refer to what we call pancakes. Preheat your oven to 375°F. Line a large baking sheet with parchment. In a large bowl, whisk together the flour, oats, salt, sugar, coriander and baking powder. Cut in the butter until the mixture resembles coarse crumbs. In a separate bowl, whisk together the eggs, yogurt or sour cream, cream and the vanilla extract. Stir this mixture into the dry ingredients. Add the nectarines and stir just until everything is well-combined. This makes a pretty sticky dough. Makes 8 to 12 scones. 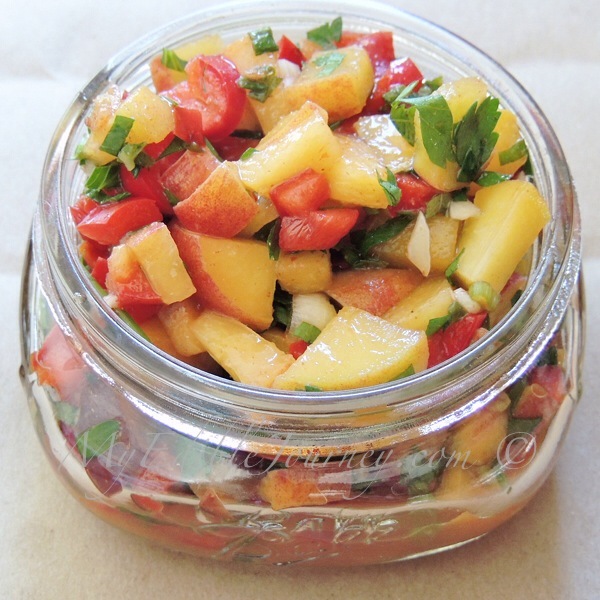 This entry was posted in Biscuits and Scones, Desserts, Fruit, Sauce and tagged apricot, barbecue, basil, lemon balm, nectarine, peach, pizza, salsa, scone on August 7, 2013 by Mama B. Thanks. Checking out your blog now. So much deliciousness! Nice post! I love salsa and http://68anda6pack.com/2013/06/25/the-turbocharged-popeye-breakfast/ taught me how to enjoy it without that guilty feeling of being unhealthy. More power! Wow, that’s some breakfast. Thanks for popping by!